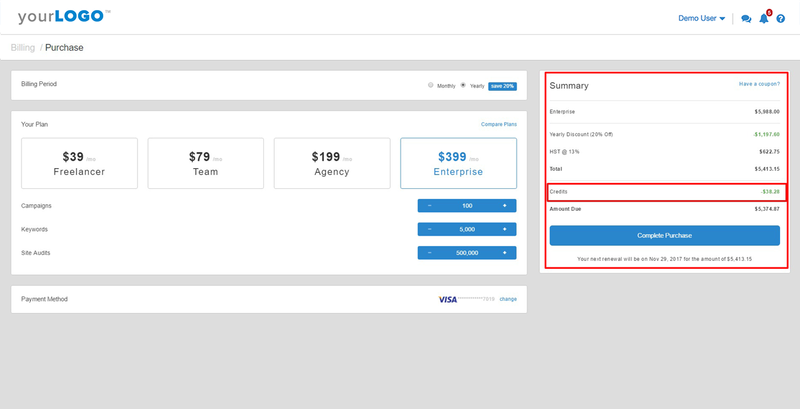 First, navigate to your Billing dashboard by clicking your name in the upper right hand corner of your screen, and then clicking the "Billing" tab in the fly-out window that appears. Once you're in the Billing dashboard, click the "Update Subscription" button in the box under your plan name. In the next screen, toggle your selection to "Yearly", and choose the plan to which you'd like to subscribe. In the fee total to the right, you'll see that a line item for "Credits" has been applied. This is the amount left on your existing monthly plan. When you upgrade to a Yearly plan subscription, the existing monthly plan subscription is canceled. Rather than processing a refund, we apply this pro-rated discount toward your Yearly plan. The amount is pro-rated based on how many days has elapsed since you made your last monthly subscription payment. For example, let's say you're currently subscribed to a monthly "Agency" plan, at $99 per month. You made your last $99 payment on September 4th, and your next $99 payment is due on October 4th. For the purposes of this example, let's say that today is September 17th. Your monthly plan is pro-rated to the amount of $99 / 30 = $3.30 per day. As a result, you'd be credited 17 * $3.30 = $56.10 toward your yearly subscription. In addition, the subscription date will be reset to today's date, and your next billing will be one year from today, on September 17th of next year for our example. (Note that this specific example is not reflected in the screenshot below). Next, choose whether you'd like to checkout using a Credit Card, or using Paypal. If you choose "Credit Card" go ahead and enter your payment and location information. Then, click the blue "Complete Purchase" button to the right. To choose Paypal, first toggle the radio button from "Credit Card" to "Paypal". After you do so, a window will automatically pop up redirecting you to log in to Paypal. 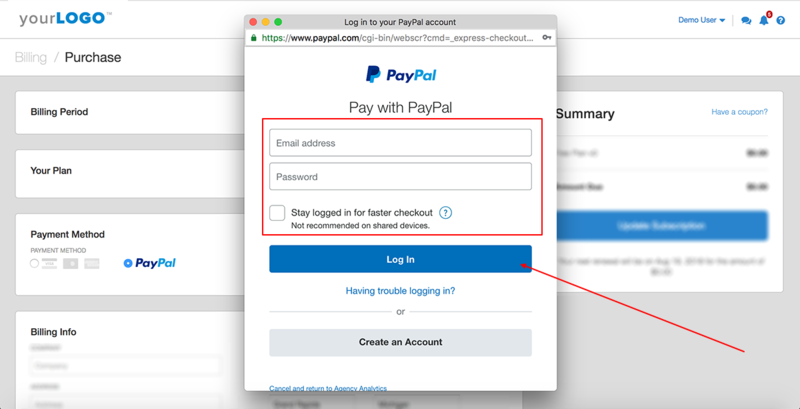 Enter your credentials to login, then complete your payment on the Paypal site. 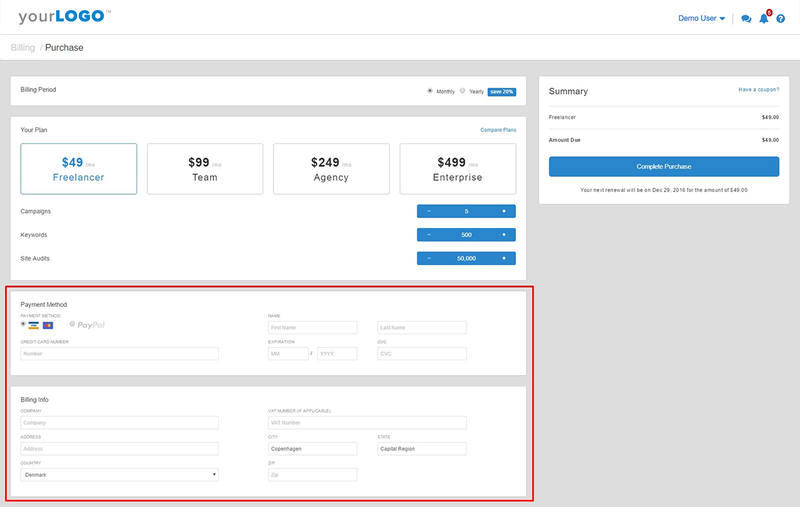 With either method, once payment has been completed, you'll be redirected to your dashboard with the changes applied!